Have a go if you’re Hardy enough. Watching Tom Hardy lay the building blocks for Hollywood ubiquity has been a pleasurable pastime these last few years. But before The Dark Knight Rises and Mad Max: Fury Road, we have Hardy’s first above-the-title shot in a weighty US production. He plays Tommy, a cage-fighting brute so rage-filled he’d leave prison monster Charles Bronson (whom Hardy played in 2008) a quivering wreck. 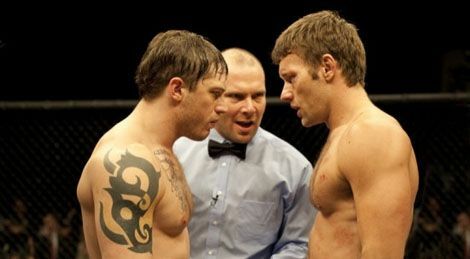 Hardy’s talent for tempering fierce masculinity with deep, soul-aching complexity is given a full airing in this tale of two estranged blue-collar brothers who enter the same international martial-arts tournament, seeking its $1m prize. Joel Edgerton’s Brendan is the less-skilled elder brother who got the better half of their raw-deal childhood (raised under a barrage of alcoholic abuse by Nick Nolte – ‘nuff said). Yet Tommy enlists their father’s aid, despite resenting him with every fibre. Gavin O’Connor’s last film was 2008’s Pride And Glory and, although Warrior runs with a similar vibe of bruising encounters and rancid familial relations, it’s arguably the weaker film. That’s chiefly because O’Connor ends up forsaking potent family dynamics in favour of letting fists and feet fly. If you’re a cage-fighting fan, or simply feel the more face-pulping the merrier, you’ll be sated. But as impressively realised as they are, Warrior’s relentless brawls undo O’Connor’s dramatic ground-laying, cheating his stars of the chance to dig deeper and leaving the film fizzling to an unsatisfying conclusion.